The photo above is from the Church of St Simon Stock in South Ashford. The new altar frontal was made by a parishioner. Fr Boyle has done a great deal to enhance the dignity of the sanctuary of his simple but devotional Church. 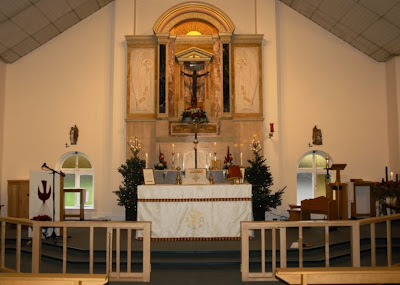 For more information on why altar frontals are a Good Thing, see the excellent article by Shawn Tribe on the NLM last October: The History, Development and Symbolism of the Antependium, Altar Frontal, or "Pallium Altaris"